The Friends of Friendless Churches was formed in 1957 by proud Welshman, Ivor Bulmer-Thomas. The Friends’ Minute Book (1957-1977) records that their first meeting was held on 3rd July 1957, in Committee Room 13 of the House of Commons. 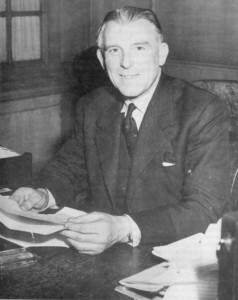 Ivor Bulmer-Thomas was elected Chairman and Honorary Director and the Executive Committee comprised an influential group of individuals, including the architect HS Goodhart-Rendel, the philanthropist Samuel Gurney, the politician Roy Jenkins, Lady Mander (owner of Wightwick Manor, Wolverhampton), the artist John Piper, the banker and politician John Smith, and the architectural historian John Summerson. John Betjeman was elected Honorary Editor, Lawrence E Jones Honorary Secretary, and the architect Sir Albert Richardson a Vice President. Initially the Friend’s pursued their objectives by campaigning and grant aiding, and hoped, after the introduction of the Pastoral Measure (1968, revised 1983) and the formation of the Redundant Churches Fund (now the Churches Conservation Trust or CCT) that they would be able quietly to dissolve. As Ivor was the first Chairman of the Fund he obviously had a vested interest in its success. However the Committee felt strongly that historic churches (such as Lightcliffe St Matthew Old Church and Wickham Bishops St Peter) which were good enough to be vested with the Redundant Churches Fund were being turned down by the Church Commissioners. Born 30 November 1905 – 7 October 1993, Ivor Bulmer-Thomas was a British journalist and author who served eight years as a Member of Parliament (MP). As a result, in 1972 the Friends amended their Constitution and established a company, The Friendless Churches Trust Ltd, enabling them to take direct ownership of buildings, under the Pastoral Measure, by freehold or by lease, which they felt were too important to be demolished, converted or left to decay. The residual tower at Lightcliffe was the first vesting with the Friends.